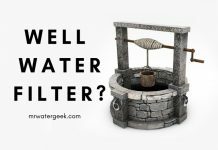 Home Water Filters Whole House Water Filter Reviews Is iSpring Whole House Water Filter Really WORTH It? 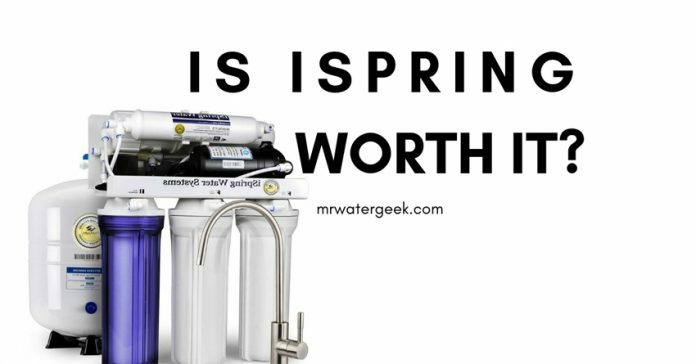 The iSpring whole house water filter is a water filtration system that can filter impurities at home by various different means. However, the basic principle they use remains the same as standard whole house water filters. Here is a brief explanation of how these systems work. Generally, the iSpring whole house water filter is connected to the main water line so that all the water entering the house is filtered. When water enters the filter system it will first encounter a sediment pre-filter. This filter has been specially designed to remove the largest particles of water such as sand, debris, mud, rust, dirt and other large contaminants. However, this is not its only role. This filter also plays an important role in maintaining other filters you have in the home. And it will do this over a longer period of time. Without this filter, the other filters in your home (e.g. a faucet filter) would have to be changed more frequently. 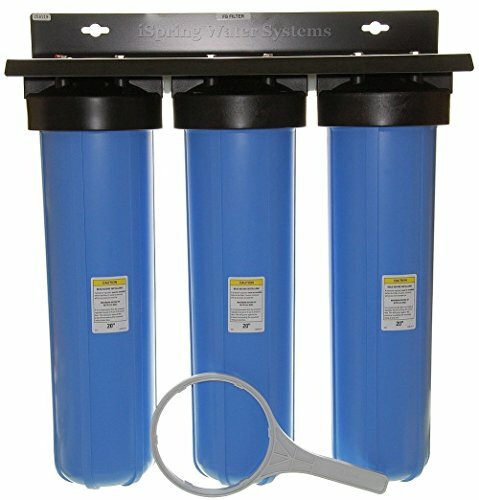 iSpring Whole House Water Filter Alternatives? Yes, they are very expensive but you can use coupon code AQGEEK50 to get up to 50% OFF. iSpring is a brand of water products that is based in the United States. As a US company, iSpring provides US-based customer service. This customer support is available by e-mail and phone before and after your purchase. Reviews online (including their FaceBook page) shows that customers are generally happy with the customer support that they receive. This is good to note because I don’t recommend brands that don’t look after their customers. 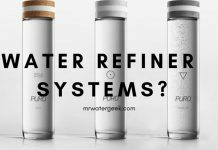 Especially as the purchase and installation of a water filtration system for the entire house is a very big purchase decision. This iSpring Whole House Water Filter model is the largest filter on the market, which means that the water flow is not affected. 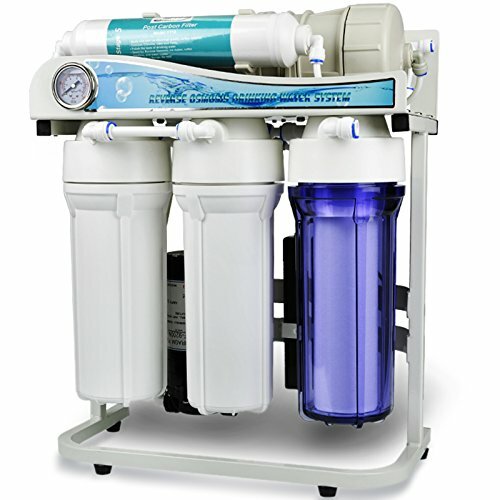 A key aspect of the iSpring WGB32B is its reverse osmosis filter are significantly cheaper than their competitors. The filters for this entire home system are also among the cheapest available. This means that it’s easy to find and replace these filters. But despite its low price, this system is still able to provide and filter water throughout the house. Dimensions: 24 x 12 x 36 inches. Filter Lifespan: Between 6 to 12 months. Water Flow Rate: Up to 15 gallons per minute. A superior and more powerful alternative: Aquasana Rhino 10 Year Gallon. Cost: $$ – see latest price. 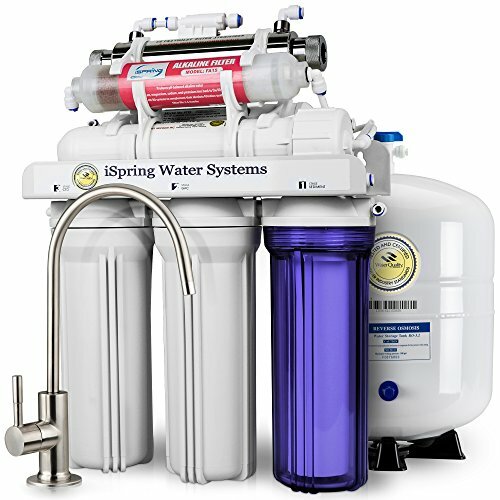 The three-stage iSpring whole house water filter system offers three protective layers against harmful water pollution. The first-stage filter protects against larger particles such as rust, sediment, dirt, heavy metals and sand. This filter uses multilayer technology, which allows more gradual filtering. This means that the filter clogs less quickly. In short, the outer layer of the filter has larger holes (larger micrometer size) and the holes become smaller as the filter approaches the inner layer. This has the effect of reducing the clogging of the filter pores, which may cause a pressure loss. This also means that your filters last a little longer. This filter offers protection of up to 5 microns so that only the smallest particles pass through. From the beginning, the large blue filter housing 3 can accommodate a variety of different filter cartridges. 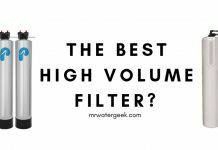 This means that you can adapt it to your specific filtration needs with different filter combinations. 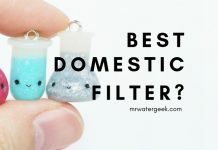 And since it’s not tied to a specific brand, you can search for the best deals on replacement filters and save a lot of money in the long term. The WGB32B-PB version is the most expensive but one of the most effective systems for treating water. It can treat high sediment water and removes dangerous heavy metals like mercury and lead. If you do not need such a powerful 3-tier home system, the iSpring also offers this product line in 2 stages. The cheapest WGB32B is ideal for water supply in the city. 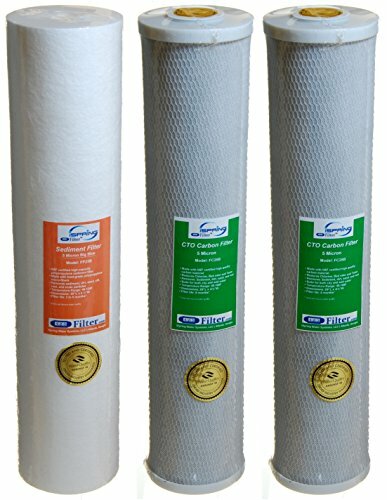 The 2 carbon filters are ideal for treating high levels of chlorine. The 2-stage systems are available in the same 3-tier options, but they are cheaper and allow for faster water flow. All of these filters are NSF certified. The NSF is a public health and safety organization that ensures the filter has been tested to the highest safety standards. Only water filter systems of the highest standard receive these certificates. The replacement filters are cheap. You definitely need DIY skills for installation. American based customer services. 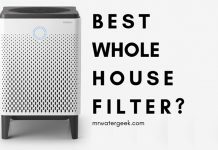 Not as powerful as other whole house filters like Aquasana Rhino. You can use different branded filters if necessary. You still need a water softener if your water is hard. Great option for municipal water. This whole-house water filter is a great way to protect your home from the most harmful water pollutants. It is strong enough to protect against the most common contaminants. 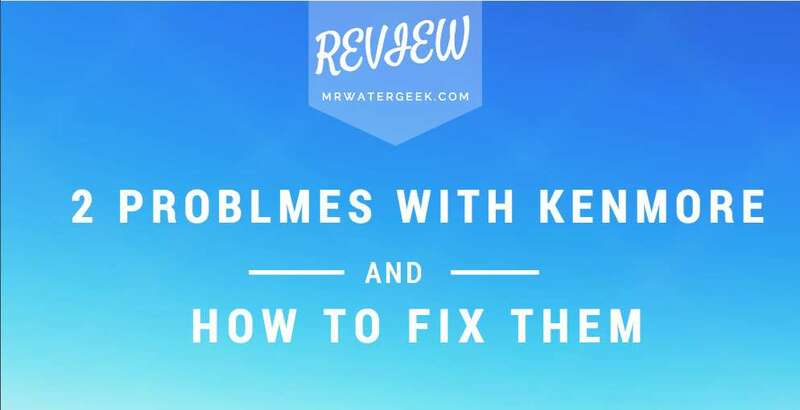 It will not filter all the water in your home (just in one place) if you don’t connect it to your water mains entry point. If you need something stronger that will adequately filter all the water in your home, the Aquasana Rhino is the best option. However, finding the best water filter for the whole house is not tantamount to finding the most expensive one. Each water filter is better at removing some impurities and less effective at eliminating others. Therefore, you need to know what the filter needs to remove so that you can select the correct model. 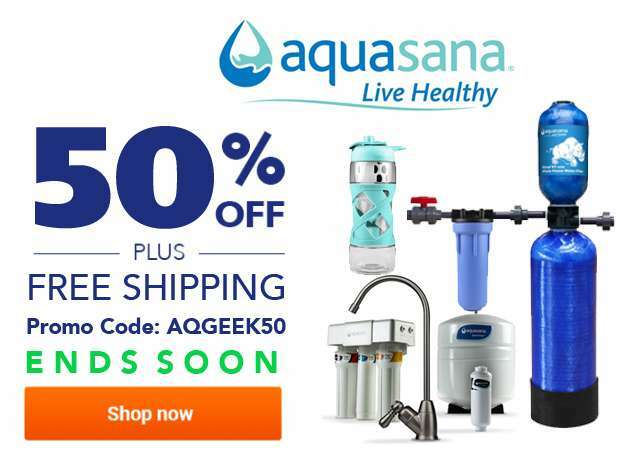 If you don’t want to have to do any more research and just buy a filter / softener combo that will deal with everything for your whole house choose the Aquasana Rhino or OptimH20. Next articleAquasana Fluoride Filter Review: Is It WORTH Buying?